This paper deals with microfluidic studies for lab-on-a-chip development. The first goal was to develop microsystems immediately usable by biologists for complex protocol integrations. All fluid operations are performed on nano-liter droplet independently handled solely by electrowetting on dielectric (EWOD) actuation. A bottom-up architecture was used for chip design due to the development and validation of elementary fluidic designs, which are then assembled. This approach speeds up development and industrialization while minimizing the effort in designing and simplifying chip-fluidic programming. Dispensing reproducibility for 64 nl droplets obtained a CV below 3% and mixing time was only a few seconds. Ease of the integration was demonstrated by performing on chip serial dilutions of 2.8-folds, four times. The second part of this paper concerns the development of new innovative fluidic functions in order to extend EWOD-actuated digital fluidics’ capabilities. Experiments of particle dispensing by EWOD droplet handling are reported. Finally, work is shown concerning the coupling of EWOD actuation and magnetic fields for magnetic bead manipulation. 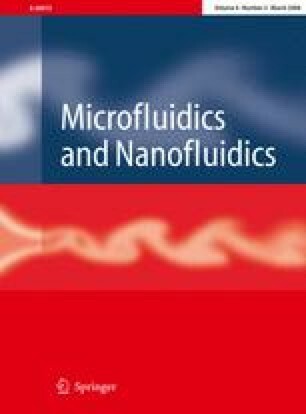 The authors would like to thank Olivier Constantin, Gaël Castellan and Nadine David for preparation of the fluidic components, and Nicolas Chiaruttini for experimentations with magnetic beads. This work was funded by the French research ministry.